This CSS calculator was built for lazy people like myself. 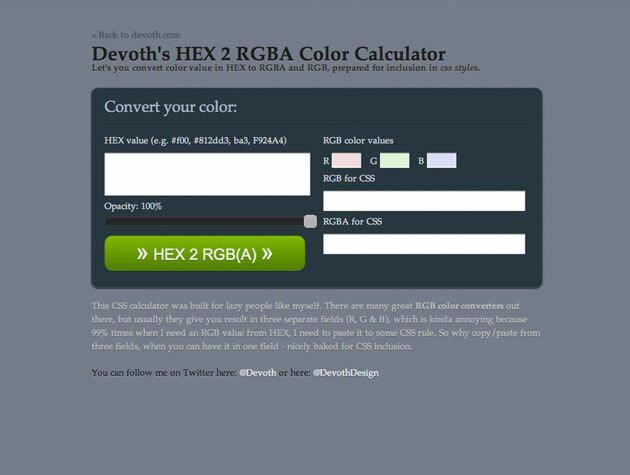 There are many great RGB color converters out there, but usually they give you result in three separate fields (R, G & B), which is kinda annoying because 99% times when I need an RGB value from HEX, I need to paste it to some CSS rule. So why copy/paste from three fields, when you can have it in one field – nicely baked for CSS inclusion.